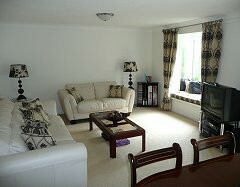 Luxury Apartment, Gleneagles Hotel and Golf Resort. Sleeps 5/6 people. £650 - £1200 / week. This first floor luxurious 3 bedroom apartment is set within the mature grounds of Gleneagles Hotel, (situated to the right of the tennis courts in photograph) Auchterarder opposite the Equestrian Centre. 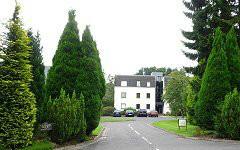 Guthrie Court is a small development in private grounds adjacent to the world famous Gleneagles Hotel and Golf Resort. 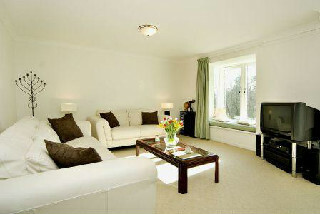 Gleneagles is poised on the edge of the Highlands, just outside Auchterarder. 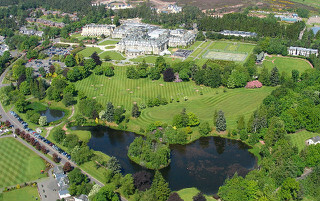 Nearby Gleneagles Hotel, the great Palace in the Glen, is a resort geared for enjoyment and offering a wide range of sports and leisure facilities, many of which are available to non-residents of the hotel. In addition to the three 18-hole championship golf courses and the nine-hole Wee Course, there is a Golf Academy and practice ground. The PGA Centenary Course will host the Ryder Cup in 2014. Fishing, falconry and horse riding can also be enjoyed. Auchterarder village itself boasts many shops, restaurants, an excellent butcher shop, delicatessen and bakers. The property was developed in 1976 within the mature grounds of Gleneagles Hotel and features an open plan lounge/ dining room with balcony and outside seating area with the kitchen is fully equipped including a washing machine and dishwasher. The lounge has a TV with DVD player. There are books and games for you to use. 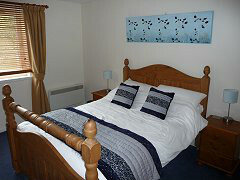 The 3 bedrooms consist of 2 double rooms (1 en-suite shower room) and 1 single room (which can be converted into a twin for an extra person). There is a separate bathroom. 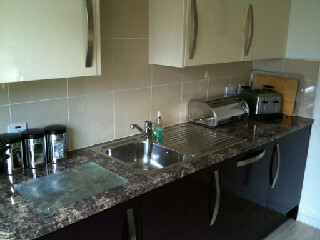 The fully fitted kitchen was replaced in 2009. Electricity, towels, bedding and the luxury of bath robes included in the cost of your holiday. Additional fold-out bed or cot on request. Auchterader is a beautiful Perthshire village. 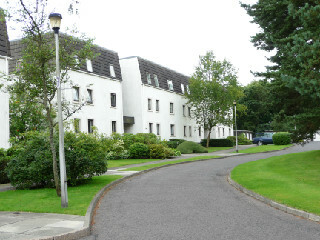 Guthrie Court is a small development in private grounds adjacent to the world famous Gleneagles Hotel and Golf Resort. 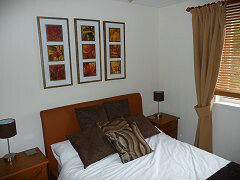 Gleneagles is poised on the edge of the Highlands, just outside Auchterarder. Rising to the south are the Ochil Hills, and there are far-reaching views on a clear day, as far as Ben Lomond to the west and the Grampians to the north. Within easy reach are the sophisticated cultural, retail and social facilities of both Glasgow (45 miles) and Edinburgh (43 miles). The Royal Burgh of Auchterarder town is laid out with a long main street giving it the nickname of the Lang Toon. Alexander II granted the canons of Inchaffray rights over Auchterarder in 1227. Edward I of England spent a night in Auchterarder Castle during his 1296 invasion of Scotland. In 1328 Robert I (Robert the Bruce) granted the town to the Montifex family, from whom it passed by dowry to the Drummond family. After the Battle of Sheriffmuir in 1716 the town was burnt by Jacobites. It was rebuilt shortly afterwards but remained small as it did not lie on the important military roads being built through Perthshire. However, from 1760-1780 linen weaving, a dye works and a paper mill were established in the town. The railway arrived in 1848. Auchterarder itself has plenty of shops including antiques, designer clothing, furniture, bakers, butchers with an abundance of restaurants, coffee shops, a sports centre and it is ideally positioned close to the cities of Perth and Stirling. Perth City is a beautiful place to shop, eat, drink and be entertained. Although the city has some amazing restaurants, pubs, cafes, shops, it can also boast a traditional cinema, a Victorian theatre and a new Concert Hall. Come to Guthrie Court not only to be near to The Gleneagles Hotel and Golf Courses, but also to enjoy so many of Scotland's most famous attractions, countryside and activites. One visit will not be enough!